What’s the biggest asset we have in this region in terms of economic development? I think our secret sauce is a couple of things. Our location, 98 miles to Atlanta airport, which will take you anywhere in the world. Couple hundred miles easy drive to Port of Savannah. Our climate. I have people tell me all the time that if you live anywhere above St. Louis, you’d do anything to live in a place like Columbus with a 10-month enjoyable climate..
Our vibrant business economy. Amenity-rich downtown. The river. The military. All that is combining to building Columbus into a city, that’s hard to compete with. What’s the biggest challenge the region faces as far as economic development? We are Georgia’s best-kept secret and maybe the Southeast’s best-kept secret. But we haven’t been in the face of people telling them how great it is in Columbus. Because even people in Atlanta don’t know our story. I’ll go up to the state capitol and meet with state legislators and they don’t really have a sense of what Columbus is like. Also, our level of poverty. It’s consistent with a lot of cities our size. But we have to be intentional about reducing poverty. We have to be focused on helping our citizens reach another step up on the economic ladder. Their individual success also translates into economic development. How would you describe the Chamber’s relationship with Columbus Consolidated Government? 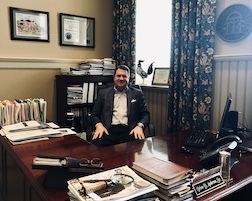 Having come from another place [Anderson led the Dalton, Georgia Chamber before becoming President & CEO here in June 2015) , and been around a lot of communities, I’d say it’s excellent. Some people say, ‘Oh, you have to sit through those five-hour Council meetings.Deal with cantankerous elections.’ That’s just part of the process. We have a very good Charter. The city-county consolidation, for our sized city, is the best form of government. We don’t have infighting like a lot of people do. We have 11 people between the mayor and the council that get the fact that we’re better off working together than apart. They make sure they’re working to help the efforts of the United Way, of the Chamber, of arts organizations. Yes, we’re going to argue when we’re going to do a SPLOST. But we’re not going to argue just because you’re the city and I’m the county. Is there a problem with the city of Atlanta gobbling up too much of the economic development in Georgia? That’s the answer shared by everybody that’s not Atlanta. Atlanta, because it’s really the only thing of its size. Then there’s the hub cities—us, Savannah, Macon, Augusta, Albany. Then there’s everybody else. There’s estimates that, out of Georgia’s 159 counties, only 25 counties are considered in a position to grow. All the rest will lose population. If you’re a rural community, you can do everything possible, but you’re still going to lose. The hub cities can do it all right—but still have to get a little bit lucky. Atlanta—even with all its problems, congestion, and high cost of living—will continue to grows in spite of itself. What’s the most important transportation investment we can make right now? We only have one carrier. So, that means if there’s bad weather, if they lose their flight crew, then that flight gets cancelled. If we have two competing airlines, that won’t happen. Chattanooga went through this. They got a really robust second carrier and it’s been a huge boost. High-speed rail, for right now, just isn’t cost effective. I applaud Mayor Tomlinson and others who are thinking very long term. But the ridership just is not there—I know some studies say otherwise—but it requires changing so much of our behavior. I just think it’s going to be a long time before we see this connecting major cities because of the cost. Interstate 14, if I could wave a magic wand and not factor in our country’s fiscal problems, I could make a case for it. The connectivity looks great on a map. However, right now, those that make a difference in these decisions and have to put their stamp of approval on it, aren’t calling for it. The Dept. of Defense is not endorsing it. Not that they don’t’ believe in it. But if you can’t maintain what you have now? How can you justify shifting money into building something not considered critical? I support Interstate 14 philosophically. It ought to be on the radar, though, because things can change. What does the economy of the future look like in Columbus? The whole American economy is translating more and more into being IT-based. Automation is going to continue to affect manufacturing. We need people that can understand IT and design IT. We have to raise the bar for our young people and get them thinking IT. So if we make a robot that can do XYZ, let’s make it in Columbus. Let’s design it in Columbus. Let’s repair it in Columbus. Recently, Pratt Whitney announced they’re going to invest almost $400 million in Columbus. That’s a grand slam by any measure. Our incentives in Columbus for Pratt Whitney’s project probably total $3 million. 3 for 400? That’s great return on our investment. Streetscape and the Riverwalk—$300 to $400 million. CSU had two $100 million capital campaigns. I’ve calculated and can get close to a billion dollars in public-private investments made in the last couple of decades. That’s why we’re doing Columbus 2025—because don’t we need a pretty good vision for how to spend the next $1 billion? There are a lot of great places in the country, but we have as good of a future outlook, as good of a current situation, as good if not better visionary civic leaders, as anywhere. I’m very bullish on Columbus. Professional: I was in the Army, I was an intelligence officer. I wanted to get into business when I got out and worked 10 years at Coca Cola, 8 years at Budweiser. I’ve been in the Chamber world 11 years now. Book currently reading: Shoe Dog: A Memoir by the Creator of NIKE. Phil Knight’s story. He talks about how for the first 10 years they were barely making it. 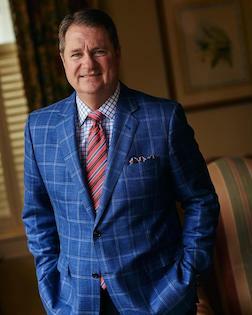 TSYS didn’t start out as a billion-dollar global company. It was a division for Columbus Bank & Trust processing credit cards. Aflac started with the Amos brothers selling insurance out of the back of their car. We have to change that mindset of looking down our nose at people struggling to build their business idea. We’ll assist everybody from Pratt Whitney executives to a guy that wants to make sandwiches. That perspective—that we work for everybody to grow our economy—is more important than I thought before this book. We don’t know how the next Nike is going to be. Figure from American business history that you admire: Stephen Covey, author of The Seven Habits of Highly Effective People. The highly functioning business people that I know use Dr. Covey’s system. It teaches you that if you care just about profit, then you’re only going to reach a certain level of success. My business philosophy now is that my job is to be a better human. There’s a profit motive always but it should be to fund something else. Not to be the richest man in the world. Dr. Covey changed my whole belief of how I worked: Away from focusing on how to get the next promotion, how to make more money, into a self-actualization of becoming a well-rounded as a person and to help those that I work with do the same.